While browsing the Martha Stewart Weddings Website, I came across so many adorable ways to add special touches to wedding invitations. One detail that I particularly love that they suggested, was to choose the stamps for the invitations custom to your theme or location. You can either contact the United States Postal Service or even search for discontinued stamps that are sold on sites such as Ebay. Whether it may be a vintage, discontinued stamp revolving around your theme or a stamp specific to your destination, we love this small detail for your guests to admire. 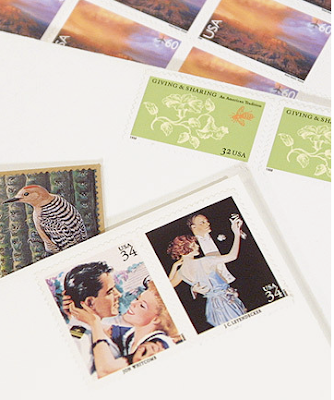 Wonderful - Love the look of these wedding theme postage stamps. If you can't find these on ebay or at the USPS, visit Perfect Postage and we can create a design to for you.